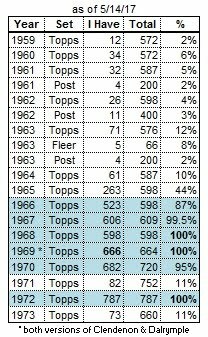 Everyone knows about Roger Maris (#330) and his 1961 season, so I won't re-hash that here. 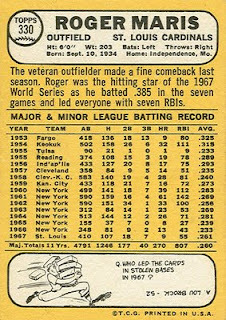 Roger's major league debut was in 1957, with the Indians. Before that, he played minor-league ball in the Indians' system for 4 years, including a stop in Reading, PA in 1955 (then an Indians' farm club, but since 1967, the Phillies' double-A team). In mid-1958, the Indians traded him (along with 2 other guys) to the Kansas City Athletics for infielder Woodie Held and 1st baseman Vic Power. As with most good Athletics players of that era, Maris was eventually traded to the Yankees. New York acquired Maris (and 2 other guys) for P Don Larsen, RF Hank Bauer, LF Norm Siebern, and 1B Marv Throneberry. 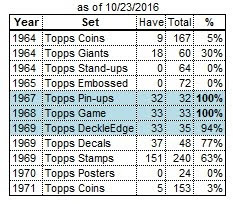 As you can see by the back of his card, as soon as Maris joined the Yankees, he became a homerun machine. He appeared in 5 straight World Series with the Yankees (1960-64). 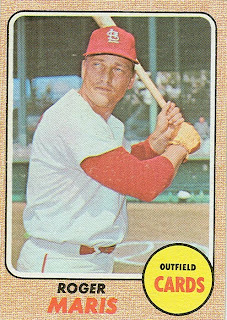 After the 1966 season, Maris was traded to the Cardinals for 3rd baseman Charley Smith. After 7 seasons with the Yankees, Roger could now be "just another guy" on a team already led by Bob Gibson, Orlando Cepeda, Lou Brock, and Curt Flood. He played his final 2 seasons in St. Louis, and appeared in the World Series both years. A nice way to wrap up a career! Tommie Aaron - Why does he have a card? No, I said 100 threads per inch!